BOISE – For one quarter, Kellen Moore was imperfect. The rest of the night, Boise State’s record-setting quarterback was nearly flawless, and was backed up by a dominating defense. Moore shook off an interception and fumble in the first quarter to throw for 333 yards and four touchdowns, two each to Titus Young and Austin Pettis, and the No. 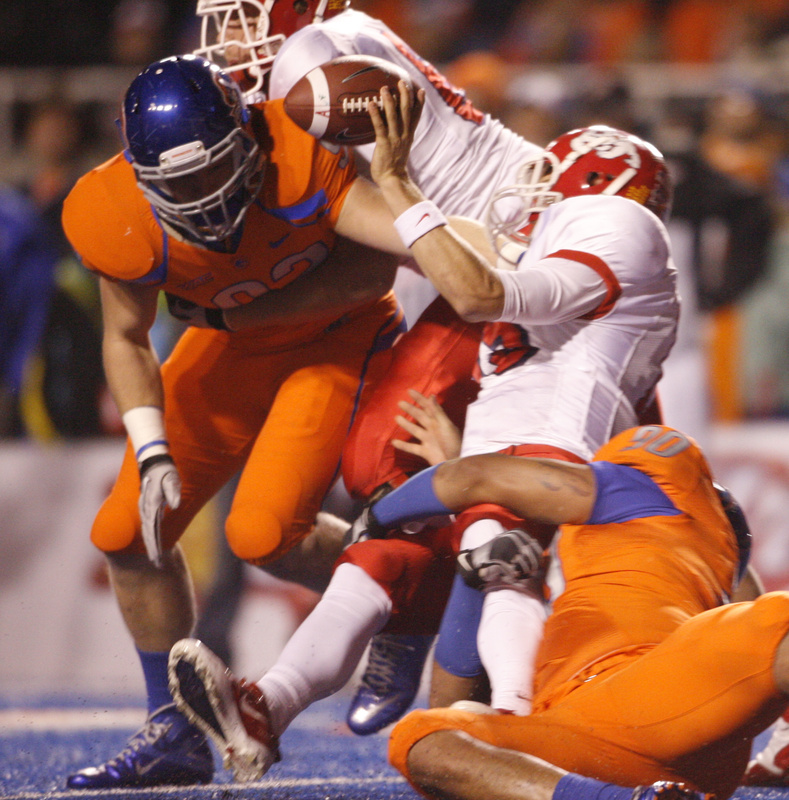 3 Broncos used a smothering defense to rout Fresno State 51-0 on Friday night. With the rest of the BCS hierarchy – Oregon, Auburn and TCU – taking the weekend off, the national stage belonged to Boise State. And after sputtering through the first quarter in their all-orange uniforms – worn for what was believed to be the first time in nearly 20 years – the Broncos (10-0, 6-0 WAC) rolled to their 24th straight win, extending the longest win streak in the country. The Broncos handed Fresno State its first shutout loss since a 10-0 loss to San Diego State on Nov. 7, 1998. The Bulldogs entered the night averaging nearly 400 yards and 35 points per game. The Bulldogs (6-4, 4-3) managed just nine first downs and 125 total yards. Moore and Young were the offensive stars and in the process added their names to even more pages in the Boise State record books. Moore became the school’s all-time leader in yards passing, jumping past Ryan Dinwiddie. By the end of the regular season, Moore could crack the 10,000-yard mark. Young has been on the receiving end of many of those yards and became Boise State’s all-time leader in yards receiving on a 42-yard touchdown reception in the second quarter that gave Boise State a 17-0 lead. Moore completed 27 of 38 throws, while Young grabbed eight passes for a career-high 164 yards. Even kicker Kyle Brotzman got into the record book, becoming the school’s all-time scoring leader, helped by field goals of 20, 20 and 50 yards. BSU – FG Brotzman 20, :53. BSU – Martin 1 run (Brotzman kick), 8:34. BSU – Young 42 pass from Ke.Moore (Brotzman kick), 6:15. BSU – FG Brotzman 20, :00. BSU – FG Brotzman 50, 7:21. BSU – Pettis 15 pass from Ke.Moore (Brotzman kick), 3:46. BSU – Pettis 6 pass from Ke.Moore (Brotzman kick), :02. BSU – Young 28 pass from Ke.Moore (Brotzman kick), 12:29. BSU – Hodge 4 run (Brotzman kick), 4:59. RUSHING – Fresno St., Rouse 17-70, Burse 2-1, Hamler 1-(minus 1), Colburn 7-(minus 21). Boise St., Martin 24-72, Avery 8-27, Hodge 5-21, Young 1-5, Ke.Moore 2-0. PASSING – Fresno St., Colburn 6-23-2-76, Burse 0-1-0-0. Boise St., Ke.Moore 27-38-1-333, Southwick 2-2-0-8, Pettis 1-1-0-50, Team 0-1-0-0. RECEIVING – Fresno St., Hamler 3-37, Johnson 1-21, Saunders 1-10, Burse 1-8. Boise St., Pettis 10-93, Young 8-164, Shoemaker 4-77, Martin 3-22, Efaw 2-27, Koch 1-4, C.Potter 1-4, Avery 1-0.